Where is this platform? What is the engine? What sort of carriage? Where is the train likely to be going? But what of the assorted furniture; Water column, ornate lamps etc. What is the building behind the loco. The loco is an LNWR “Special DX” and the carriage an LNWR 30ft 1in parcels van with five compartments to D425 (59 built 1889-1903). The yard lamp to the right looks typical LNWR, as is the water column . The buildings behind look fascinating – certainly one to tax Harry’s mind! It is Chester station, east end, looking NE. The interesting buildings in the background are the Railway Gas & Water Works (according to Ordnance plans) with Lightfoot Street to the right. The shed with the open door is an 'Engine Room' - perhaps with two old loco boilers within. Date is after 1895 because of the tender coal rails, but before 1909 because No 1571 was scrapped early in that year. Train is headed east - Crewe? Warrington and beyond? The DX at Chester was taken by D. H. Stuart. The building contains two train-heating boilers. “the building contains two train-heating boilers”. Does this mean that carriages were stabled nearby and perhaps heated overnight before being coupled to a locomotive? Would be interested to know how this worked as I don't remember reading about it. Presumably if the whole boiler capacity was just for train-heating several trains could be heated at once? Was this a normal procedure at most large stations? I’m a bit puzzled by Mike’s remark that this photo was taken by D H Stuart. I wouldn’t have thought he was old enough to have taken a photo as early as this one. According to his obit notice in the Feb 1978 SLS Journal, D.H. Stuart was born in 1900. I suppose it’s possible that he took the photo, but if so it’s a wonderful shot for a precocious lad who was only 8 or 9 (at most) at the time. Later he was one of the last LNWR Pupils at Crewe, under H.P.M. Beames. I don�t know whether carriage-heating boilers were situated at all centres on the LNWR but it may well have been so. 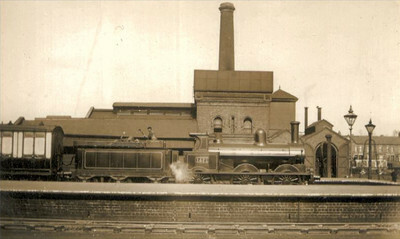 Certainly, this photo shows one at Chester and the building there housed two boilers. There was also certainly one at Buxton, because I have talked to the men who used to fire it and I also remember it working. It was not removed until work was due to start on the new diesel depot in 1956. Harry Jack is probably right in his comment about D.H. Stuart. I recall now that my print of this picture came from a copy of a photograph in an album which once belonged to D.H. Stuart. The album was copied by the NRM at least twenty years ago. So most likely the photograph was not taken by D.H. Stuart but by someone else, and was obtained by him and put into his album. If members would care to look at Chester Image Bank they will see under photo ref “ch0017” a picture taken looking in the oposite direction, ie from Lightfoot Street. The large “carraige warming” building is on the right of the view. In later LMS and BR days this became the site of the water softening plant.